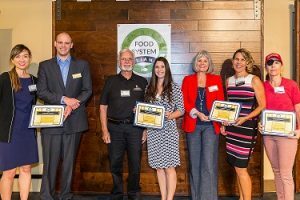 Vista, CA | Oct. 2017 — Vista Unified School District’s Nutrition Services department (aka WaveCrest Cafe), was recently honored with an EMIE Unwasted Food Award by the San Diego Food System Alliance as an emerging program in eliminating food waste. Various award recipients, including, at left, SDFSA Executive Director Elly Brown with Vista Unified’s Director of Child Nutrition Services Jamie Phillips. The San Diego Food System Alliance is a coalition of organizations and individuals organized to affect positive change in the San Diego County’s local food system. Our mission is to develop and maintain an equitable, healthy and sustainable food system for the benefit of all people in San Diego County.